Music and Basketball: outing at sunway!! haha....today outing at sunway piramid....early in the morning......i take a 9.30 bus to sunway cus that time still blur....but after reaching there....i forgot dat we gather the at 11 am....haiz.....sad case la....but i see rong kae there!! !but he like abit emo....duno y...haha....anyway..later i meet up with lee chuen them....and go arcade n play racing game and dancing game....wakakaka....i win all!! !XD..about 12 like dat mun yee only call me go and meet up with her.....she say go to mr.tepayaki and eat(i think i didn spell wrong da shop name XD)...but i saw those price i like wan to faint liao....but dis is only da 1st part!!! stephy:wa....u like dat also need to gam fei? but it looks very nice!!! haha....later we go n watch movie!! 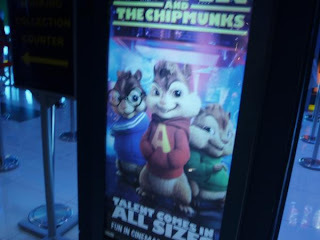 !we watch alvin the chipmucks!! !haha...is a funny movie....n at the start they sing a cute version of bad day....XD..haha...is cool!!! haha...the coke dat they order 4 me!! 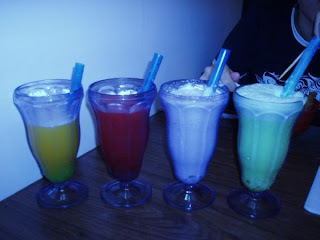 !but it cost 3.50 u noe!!!OMG!!! OMG!!! !THE WHOLE THING IS RM 50.03? !WA LIAO!!! !